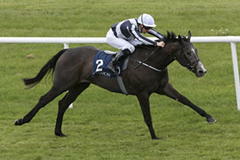 A Royal Ascot runner-up last season, Alpha Centauri was beaten a long way on her only run this campaign in April. Back on good ground, however, she reeled in long-time leader Could It Be Love to give Jessica Harrington a Classic success to go with her Cheltenham Gold Cup win of last year. Colm O’Donoghue was on board the 12-1 shot, while the heavily-backed 5-4 favourite Happily could finish only third. Donnacha O’Brien held a big advantage with two furlongs to run on Could It Be Love and it looked as though there could be a shock to top Romanised’s win in the 2,000 Guineas on Saturday. Only Alpha Centauri, backed from as big as 33-1 over the weekend, came from out of the pack to make inroads. While the filly drifted to the middle of the track, as soon as O’Donoghue switched his whip she straightened out and galloped on strongly to the line to give Harrington a first Classic victory. The winning trainer said: “It’s fantastic – I’ve finally got the Classic. “I’ve been second and third and the horses have always run really well, but this is dream come true for me to win a Classic. It’s almost as good as winning a Gold Cup! “It’s probably better, they are on a par, to win a race like this is absolutely fantastic. I’m just waiting for the Ascot winner now. “This is the first time since Ascot last year that she’s got good ground and that’s the key to her. She likes good, quick ground. “She ran here in the Moyglare on soft to heavy and her first run this year was on soft to heavy ground. “She’s a big, big filly and she just can’t pull herself out of the heavy ground. “Maybe as she gets older, maybe in the autumn, she might get a little bit softer ground. “It’s a family operation, but it’s also thanks to the Niarchos Family for sending me this beautiful horse. They have the most fantastic breed of horses. “She’s some big lady, but she’s a beautiful filly and she’s gone and done it today so onwards and upwards. I’d say we’ll look at Ascot, but we’ll let the dust settle and see what we are doing. “She’s a lovely filly to have and there is a lot of work gone into this. It’s not just me, there are an awful lot of people back at home who have done unbelievable work. “I’m lucky to have the horses I have and I’ve got some lovely two-year-olds for this year as well. While Aidan O’Brien had to settle for second and third, he was far from disheartened and has some big plans in mind. He said: “We’re delighted with the runs. Could It Be Love ran very well and we thought she would. She’s a filly that could go back to the Jersey Stakes (Royal Ascot) or something like that as she has plenty of pace. She’s a big, strong traveller. “Happily ran a very good race and the plan with her was always to step up. She might go to the French Oaks next. It was always going to be a step up in trip after this. The Irish 1,000 Guineas was first run in 1922, a year after the launch of the Irish 2,000 Guineas. The inaugural running was won by Lady Violette. It is Ireland's equivalent of the 1,000 Guineas, and in recent years it has taken place three weeks after that race. The field usually includes horses which previously contested the English version, and two have achieved victory in both events. The first was Attraction in 2004, and the second was Finsceal Beo in 2007. The leading horses from the Irish 1,000 Guineas often go on to compete in the following month's Coronation Stakes. The last to win both races was Attraction in 2004.